Background: There is a clear relationship between depression and diabetes. However, the directionality of the relationship remains unclear and very little research has considered a multi-ethnic population. 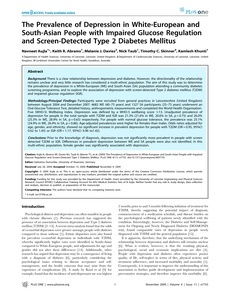 The aim of this study was to determine the prevalence of depression in a White-European (WE) and South-Asian (SA) population attending a community diabetes screening programme, and to explore the association of depression with screen-detected Type 2 diabetes mellitus (T2DM) and impaired glucose regulation (IGR). Methodology/Principal Findings: Participants were recruited from general practices in Leicestershire (United Kingdom) between August 2004 and December 2007. 4682 WE (40-75 years) and 1327 SA participants (25-75 years) underwent an Oral Glucose Tolerance Test, detailed history, anthropometric measurements and completed the World Health Organisation-Five (WHO-5) Wellbeing Index. Depression was defined by a WHO-5 wellbeing score ≤13. Unadjusted prevalence of depression for people in the total sample with T2DM and IGR was 21.3% (21.6% in WE, 20.6% in SA, p = 0.75) and 26.0% (25.3% in WE, 28.9% in SA, p = 0.65) respectively. For people with normal glucose tolerance, the prevalence was 25.1% (24.9% in WE, 26.4% in SA, p = 0.86). Age-adjusted prevalences were higher for females than males. Odds ratios adjusted for age, gender, and ethnicity, showed no significant increase in prevalent depression for people with T2DM (OR = 0.95, 95%CI 0.62 to 1.45) or IGR (OR = 1.17, 95%CI 0.96 to1.42). Conclusions: Prior to the knowledge of diagnosis, depression was not significantly more prevalent in people with screen detected T2DM or IGR. Differences in prevalent depression between WE and SA people were also not identified. In this multi-ethnic population, female gender was significantly associated with depression. © 2009 Aujla et al.